person: Don’t use 2nd person (‘you’ and ‘your’). It’s preferable to use 3rd person plural throughout – ‘people’ ‘they’ ‘them.' In a persuasive essay, ‘I’ is acceptable, but avoid repetition of “I think” or “I feel” throughout; it weakens your arguments. See more about the benefits of using first person below. titles: Italicize titles of books, magazines, films, albums, websites.... Put “titles in quotation marks” for things within a larger collection: songs, chapters, essays, articles…. Capitalize all Major Words in a Title. sentence fragment: A sentence needs a subject (who/what’s doing the action) and a verb (the action) (He ran. or He is…). 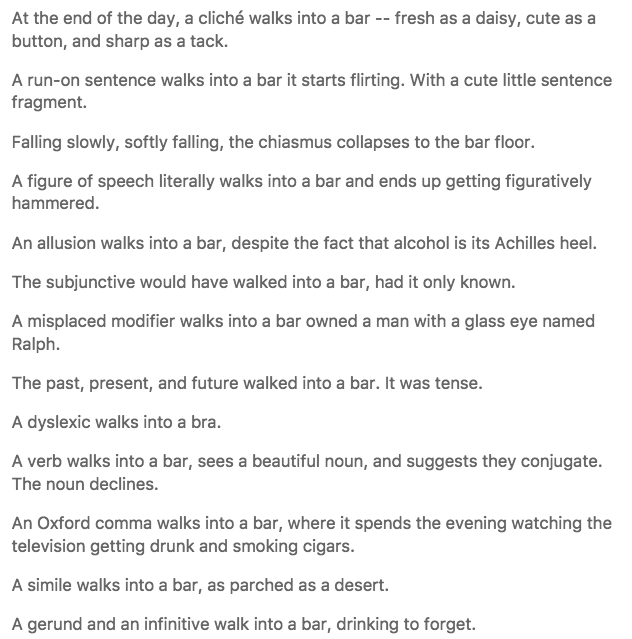 Some fragments can look like sentences because they have a noun and verb, but they start with a word like “for, which, since…,” which turns them into a subordinate clause (or dependent clause). “Since she ran all day.” is a clause that requires a subject and verb either before or after it. “Since she ran all day, she couldn’t make the dinner party." A subordinate clause on its own is a sentence fragment. 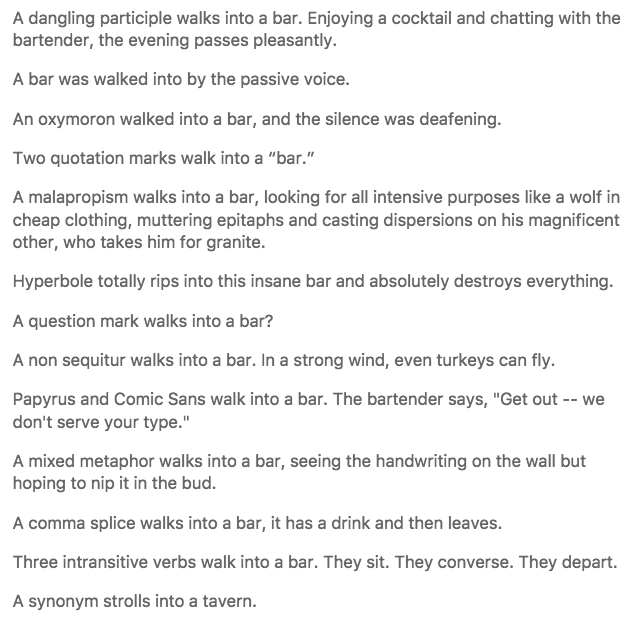 HINT – read each sentence on its own to see if it makes sense. Sentence fragments typically feel unfinished. pronoun-antecedent agreement – The pronoun (he/she or they) has to match the antecedent (the noun it’s replacing) in number (singular or plural) and person. BECAUSE “people" is third person, and “you” is second person. It’s easiest if you make all personal nouns and pronouns third-person plural where possible. NOTE: “Everybody” is singular even though it means more than one person. (Everybody is…., not Everybody are….). Also make sure the pronoun refers to the same ‘person form’ as the antecedent. 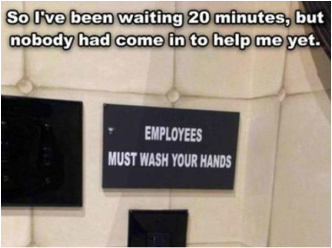 In the image above, it should say "Employees must wash their hands." Get it? prepositional usage – These words (at, in, of, from, on, under, before….) need to be followed by an object of the preposition (at the farm, in the box, of the dog….). Therefore, they should generally not appear at the end of a sentence (e.g. change “It’s what they believe in.” to “They believe in this.” and “I’m going with.” to “I’m going with them.”) But if it's more awkward to avoid ending with a preposition, it's not a rigid rule. Don't put an apostrophe in a word that doesn't show direct ownership. it's = it is (always!) its = possession (yes, without an apostrophe) Throw its ball. It's going to bite you if you don't throw its ball now! Keeping its/it's straight seems confusing because possessive nouns have an apostrophe, but the possessive pronoun 'its' doesn't. 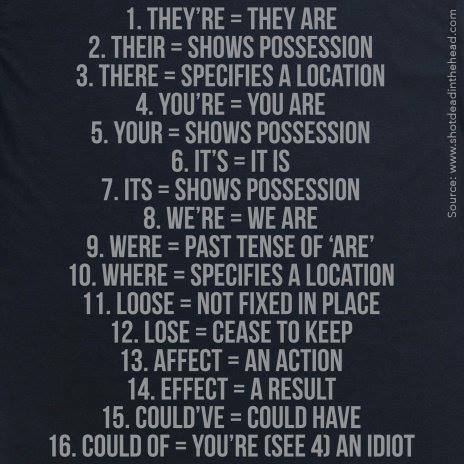 But NO possessive pronouns have an apostrophe: its, your, their, his, hers. * to set off a clause: "When I run, I see ducks. After swimming, we should eat." * to set off descriptive phrases: "Those ducks, the brown ones, look tasty." * in a series: "I like ducks, cats, and dogs." * to replace 'and': "I like big, brown coloured, fluffy ducks best." * to set off an introductory adverb: "Furthermore, turkeys are also nice." This brief video might help you remember. conditional tense - If a phrase is in the past tense, and uses the conditional ("if"), then change was to were. Assertiveness: In some cases you might wish to emphasize agency (who is doing what), as for instance if you need to point out how valuable your particular project is to an academic discipline or to claim your unique perspective or argument. Clarity: Because trying to avoid the first person can lead to awkward constructions and vagueness, using the first person can improve your writing style. Positioning yourself in the essay: In some projects, you need to explain how your research or ideas build on or depart from the work of others, in which case you’ll need to say “I,” “we,” “my,” or “our”; if you wish to claim some kind of authority on the topic, first person may help you do so."